Milk does a body good, even a hamster's body. Just like with humans, milk can help your hamster grow strong bones. It can even help treat the symptoms of a cough until you can get your pet to the vet. Not all milk is a good choice, however, and your hamster may not be interested in consuming milk by itself. As a responsible owner, you need to understand which dairy products are safe and how to properly feed milk to your pet to avoid spoilage. Dairy products work in hamsters the same way they do in humans. 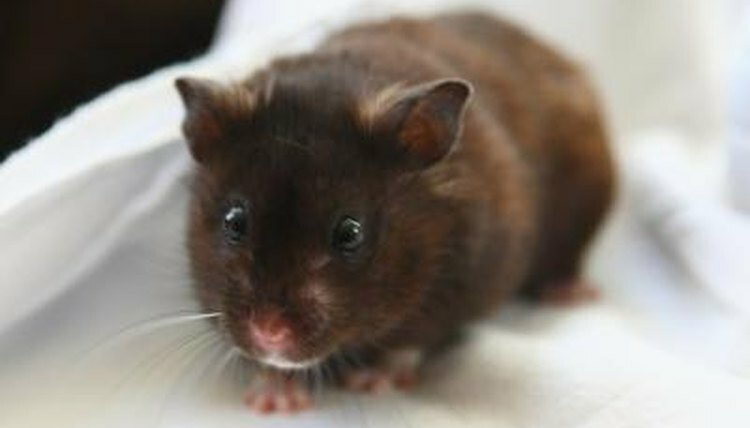 Dairy is a great way to improve your hamster's bone health, especially when he's still growing. Throughout his life, dairy products will prove beneficial to his teeth. Because the hamster's teeth are continuously growing, they need calcium and vitamin D to keep them strong. Another benefit is that milk can be mixed with warm water and honey to help ease a cough while waiting to see the vet. The probiotics in yogurt can also help your hamster when he has stomach troubles. Like humans, hamsters would probably prefer whole milk, but whole milk has way too much fat. Skim milk is a much healthier option. You never want to give your hamster chocolate milk as it can be loaded with sugar, and chocolate is poisonous to hamsters. Also avoid other flavored milks, such as strawberry. The sugar and artificial coloring in flavored milks are not good for your hammy's health. Hamsters can have mild cheese, in moderation. They can also have low-fat cottage cheese as well as low-fat or fat-free yogurt. You want to avoid unhealthy dairy products, such as ice cream, which may be high in fat, sugar and calories. Pour a small amount of skim milk in a spoon and let your hamster drink from it where the mess can easily be cleaned. Milk spilled inside the cage can quickly spoil, causing a stink and a possible illness in your pet. You can also use a dropper to feed milk to your pet, but it's more of a hassle to clean up. If your hamster doesn't seem to like milk, feed him a small piece of bread or unsweetened cereal that has been soaked in milk. Remove uneaten portions from the cage immediately to prevent spoilage. Consider milk and dairy products like treats and only provide small amounts, such as a teaspoon of milk.